Alien Hunters are needed, enlist now! Click here to play! Hunter Ship symbols give free spins depending on how many are onscreen. 3 symbols give 5 spins, 4 give 10 spins and 5 symbols give 25 free spins. A caged alien symbol can substitute anything other than a scatter or bonus symbol. The more in a single line, the bigger the prize. 2 wild symbols can pay out 2 times the bet, 3 can pay out 100, 4 can pay out 1000, and 5 caged aliens pays out 10000 times the bet for the line. The first bonus game appears when an alien egg appears on the first and fifth reels. In this game, you must collect alien eggs, avoiding the evil alien egg. 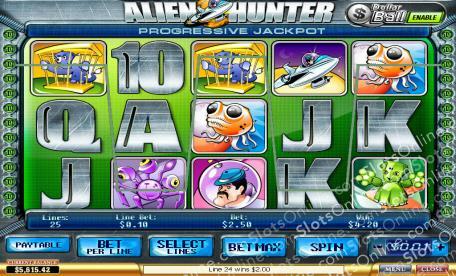 The second bonus game is triggered by three hunting bonus symbols on an active payline. In it, you must shoot aliens and may choose to get a bonus based on your skills or based on chance.